Now that you've studied the concepts on which Direct3D operates, let's start diving into the practical end of things by building a simple Direct3D program. In this program we'll just initialize Direct3D, close it down again. It isn't much, it's not even "Hello World", but it's a good start. For example, say you had a game distributed broadly and you wanted to upgrade it. Well, instead of keeping track of and shipping a new copy to every single user who ever bought your game, all you have to do is say "Upgrade! Right Here!". They download the updated COM object, and the new object plugs right in to your program without further hassle. Nice, huh? Even though COM's job is to hide all the complexity, there are four things you need to know about it. 1. A COM object is a class or set of classes controlled by an interface. An interface is a set of functions that, well, controls a COM object. In the example above, "device" is a COM object, and the functions control it. 2. Each type of COM object has a unique ID. For example, the Direct3D object has its own ID, and the DirectSound object has its own ID. Sometimes you need to use this ID in the code. 3. When done using a COM object, you must always call the function Release(). This will tell the object to free its memory and close its threads. 4. COM objects are easy to identify, because they typically start with an 'I', such as 'ID3D10Device'. Don't worry about the details of these four points. We'll see how they are all applied in a moment. Before we get to the actual Direct3D code, let's talk about the header files, library files, and other such fun things. In our demo programs, we'll have these things at the top, giving us global access to Direct3D. Let's take a look at these and see what they are. This includes the Direct3D 11 header files. These files consist of various declarations to the actual methods contained in the Direct3D 11 library. The files include different things. The d3d11.h file includes the core pieces of Direct3D. The d3dx11.h file includes extensions to Direct3D which aren't necessary to a graphics library, but which can come in very handy when writing games or other graphics programs. Note: Not all compilers will automatically locate these files. In some cases you will need to set up your project to look in the folders of the DirectX SDK. If you are using Visual Studio, I've written a quick mini-lesson on how to do this here. Direct3D 11 is actually an extention of Direct3D 10. Because of this, it borrows many macros, functions and classes from Direct3D 10. This header allows us to use these in our program. This includes the Direct3D 11 library files. The "#pragma comment" directive places a certain piece of information in your project's object file. With our first parameter, lib, we indicate that we want to add a library file to the project. We then specify which file, "d3d11.lib", "d3dx11.lib" and "d3dx10.lib". This variable is a pointer to a device. In Direct3D, a device is an object that is intended to be a virtual representation of your video adapter. What this line of code means is that we will create a COM object called ID3D11Device. When COM makes this object, we will ignore it, and access it only indirectly using this pointer. We'll cover how this happens in a moment. A device context is similar to a device, but it is responsible for managing the GPU and the rendering pipeline (the device mostly handles video memory). This object is used to render graphics and to determine how they will be rendered. As we covered last lesson, the swap chain is the series of buffers which take turns being rendered on. This variable is a pointer to such a chain. Notice that this object does not belong to Direct3D, but is actually part of the DXGI, underlying Direct3D. The first step to actually coding Direct3D is to create the above three COM objects and initialize them. This is done by using a single function, and a struct containing graphics device information. Let's take a look at this function here, then go over its parts. I didn't bother to bold the new parts, because the entire thing is new. If the comments in the code are good enough for you, excellent. Otherwise, I've described each of these commands below. There are certain factors in both beginning and advanced game programming which require certain information to be fed into Direct3D from the start. There are plenty of these, but we will only go into a few of them here. For now, DXGI_SWAP_CHAIN_DESC is a struct whose members will contain the description of our swap chain. We will go over the ones we need, and cover new members as they come up throughout the tutorial. We use ZeroMemory() to quickly initialize the entire scd struct to NULL. That way we don't have to go through every member of the struct and initialize them individually. This member contains the number of back buffers to use on our swap chain. We'll only be using one back buffer and one front buffer, so we'll set this value to 1. We could use more, but 1 will probably be enough for anything we'll do. This next member we will use to set the format of the colors. On the front and back buffers, each pixel is stored by color. This value determines what format that data is stored in. Here, we set Format to be DXGI_FORMAT_R8G8B8A8_UNORM. This is a coded flag which indicates the format. You can learn more about formats here, but you won't need to change this for now. These names just keep getting longer and longer! This member tells how we intend to use our swap chain. This table has two commonly-used values for this. Like many flag-values, these flags can be ORed together. DXGI_USAGE_RENDER_TARGET_OUTPUT This value is used when you wish to draw graphics into the back buffer. DXGI_USAGE_SHARED Typically, when a device creates a buffer, only that device can work with it. This value allows it to be shared across multiple device objects. This value sets the handle of the window Direct3D should draw in. We'll just use the same hWnd we've always been using. This member is used to tell Direct3D how to perform multisample anti-aliased (MSAA) rendering. If you are a next-gen game enthusiast, you have probably heard of this. Basically, anti-aliasing renders the edges of shapes smoothly by blending each pixel slightly with the surounding pixels. The effect is shown in the image above. On the left, you can see the line has created a stair-like effect. On the right, the image is a little bit smoothed because Direct3D blended the pixels. This value tells Direct3D how much detail should be put into anti-aliasing, the higher the number the better. Direct3D 11 video cards are guaranteed to support up to 4 here, but the minimum is 1. When we run Direct3D in a window like we are now, this value is set to TRUE. Otherwise, it is set to FALSE for full-screen mode. Note: There are other changes you will need to make before going full-screen. Changing this one value will not make your application properly full-screen, unfortunately. Patience for now. While there are no flags being used in the sample code yet, It'll be good to cover them here. They are described in this table. What this function does is create the device, device context, and swap chain COM objects. Once we've created them, we can use them to perform actual rendering. Let's start by looking at the prototype of the function. This is a value that indicates what graphics adapter Direct3D should use. A graphics adapter typically refers to a GPU and its video memory, digital-to-analog converter, etc. We could get detailed here and try to find the best graphics card available, but we'll let DXGI take care of that for us (because in most cases there's only one). To tell DXGI that it needs to decide, we use NULL in this parameter, indicating the default adapter. This parameter is used to determine whether Direct3D should use hardware or software for rendering. There are a number of flags you can use to determine this. They are listed in this table. D3D_DRIVER_TYPE_HARDWARE The obviously best choice. This uses the advanced GPU hardware for rendering. D3D_DRIVER_TYPE_REFERENCE Not everyone has hardware that runs Direct3D 11. If you are such a person, and wish to run Direct3D 11 features, you will need to use this flag. It is slow (veerry slow), but it will at least run. You can use it until you have a Direct3D 11 graphics card. D3D_DRIVER_TYPE_SOFTWARE You can optionally build your own software-based rendering engine. This is usually very slow, but you can do it. D3D_DRIVER_TYPE_WARP WARP is a high performance software engine that runs older Direct3D features. You can find out about how to use it here. D3D_DRIVER_TYPE_NULL Use this flag if you don't intend to render. Direct3D can be used for other things than rendering, such as accessing the power of the GPU for non-graphics programs. We won't get into this parameter. It is used with the flag D3D_DRIVER_TYPE_SOFTWARE, to set the software code. It's very slow, so we won't get into it. Flags! Flags are easy! Here we have a few flag values which can alter how Direct3D runs. These flags can be ORed together. Fortunately, we don't need any of these flags to get things going. The flags are listed in this table here. D3D11_CREATE_DEVICE_SINGLETHREADED Multithreaded rendering is enabled by default. To not allow it, use this flag. D3D11_CREATE_DEVICE_DEBUG Enables debugging. You may have to enable your application's debugging in the DirectX Control Panel as well. Debug messages are displayed in the compiler's output window. D3D11_CREATE_DEVICE_SWITCH_TO_REF It can be handy to switch from hardware mode to reference mode during runtime for debugging reasons. This allows your program to do that. D3D11_CREATE_DEVICE_BGRA_SUPPORT This allows Direct2D to work with Direct3D. Direct2D is a separate graphics library that renders 2D images only. For this tutorial you will need a Direct3D 11 video card, and so we will not get into this parameter. We can set it to NULL, and we won't have to worry about it. This parameter indicates how many feature levels you had in your list. We'll just put NULL. This is a pointer to the swap chain description struct. We just fill this with '&scd'. This is a pointer to a pointer to the swap chain object. This function will create the object for us, and the address of the object will be stored in this pointer. Easy! All the work is done for us! All we do here is put the location of the pointer, '&swapchain'. This is a pointer to a pointer to the device object. We defined the pointer as 'dev', so we'll put '&dev' in this parameter. Like the swap chain, this function will create the device and store the address in our pointer, 'dev'. More about feature levels. This is a pointer to a feature level variable. When the function is completed, the variable will be filled with the flag of the highest feature level that was found. This lets the programmer know what hardware is available for him to use. We'll just set this to NULL. This is a pointer to a pointer to the device context object. We defined this pointer as 'devcon', so we'll put '&devcon' in this parameter. It will then be filled with the address of the device context object. There, that wasn't so hard was it? Now that we have Direct3D initialized, let's go ahead and close it down. 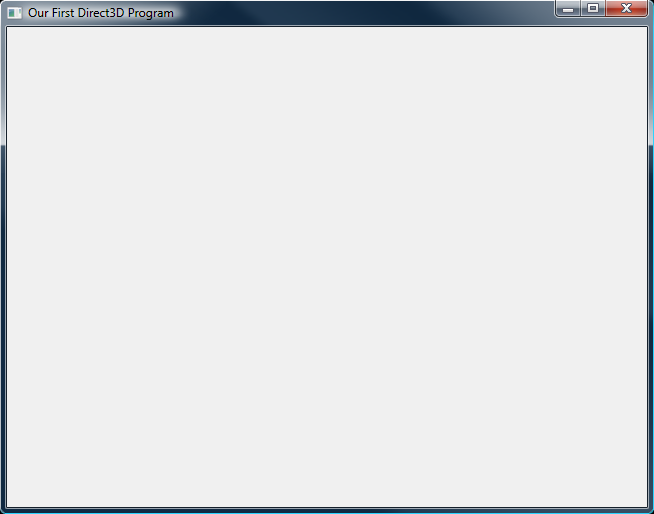 Whenever Direct3D is created, it must be closed down. This is very simple to do. Here, we call the Release() function from each of the three interfaces we created, dev, devcon and swapchain. No parameters, nothing special. Just cleans everything up. Why? Well, let's just say it would be a bad thing to do otherwise. Basically, if you create a COM object but never close it, it will just keep on running in the background of the computer until your next reboot, even after the program itself closes. Bad. Especially bad if you have a lot of resources in your game. Releasing COM objects let's everything off the hook and allows Windows to take back it's memory. Wow! That was quite a start, but it will go downhill from here. Before you run the code, there are a couple things to take note of. First, if you don't yet have a DirectX 11 compatible video card, you will need to use reference mode instead of the hardware mode, or your program will crash. Second, not all versions of Visual Studio (including the latest version) will locate the header files and library files correctly. If you get errors saying d3d11.h cannot be found, try these steps to fix them. And that's it! If you run this program you should get...a simple blank window, just like before. Only this time, Direct3D is running in the background! It isn't much yet, but you have begun the journey into the near-infinite depths of 3D game programming. You've created a window and gotten DirectX start up and close down. 1. How do you call a COM-based function? Why do you have to "release" them? 2. What is the difference between hardware and reference modes? 3. What is the difference between the device and the device context? 1. Try out various flag combinations and see what you can use (you won't be able to use most, yet). 2. Get debugging working. Comment a Release() function to see some debug warnings.